May 22, 2018 — At long last, Issue 29 is live today. Come read some new fiction. December 30, 2017 — We’re always reading submissions. October 31, 2017 — If you like our fiction, help us release more issues this year. Buy a book, donate, write a review, submit stories, tell your friends. 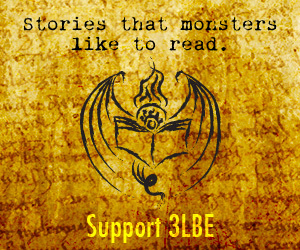 Three-lobed Burning Eye (3LBE) is an online speculative fiction magazine, bringing you stories of horror, wonder, and the weird. 3LBE launched in 1999, and has published authors Laird Barron, Gemma Files, J.M. McDermott, Kelly Barnhill, Mari Ness, Cody Goodfellow, Shweta Narayan, Nadia Bulkin, Kealan Patrick Burke, and D.F. Lewis. Each issue features six short stories. Beginning with issue 20, we offer audio readings, PDF formats, and responsive web format for mobile devices. Our current publishing schedule is twice yearly, usually Spring and Fall, with a print anthology every other year. All issues of the magazine are free online. Please consider different ways to support our publication and its authors, by donating and spreading the word. We also offer advertising opportunities. 3LBE is edited by Andrew S. Fuller.